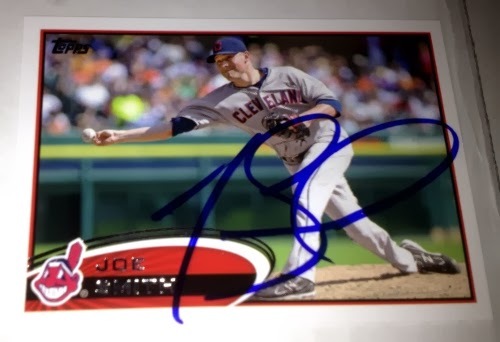 Maybe the salaries for rank-and-file MLB players have bumped up with more money in the game - so a three year, $15 million commitment for someone of Smith's talents might not be unreasonable, though I wouldn't have been itching to sign a random guy with little upside. Smith seems to be a reliever who doesn’t throw hard and doesn't close out games - maybe a smarter MLB team might find a way to acquire pitchers with some potential flailing around in the minors or veteran MLB pitchers who've bounced around, looking for another chance to pitch. I’m a baseball card hoarder and maybe the best thing about repacks - is when I’m always looking for a cardboard fix, a repack gives me an assorted number of cards to flip through when I can't always make it to the one card shop I go to and/or the card show. I was thinking of picking up some loose packs of 2013 Panini Perennial Draft Picks but I ended up with one of these Fairfield repacks [$9.99 from a Target] - with about 250 cards and two random packs in a cube, this was a little pricier than the usual $4.99 hanger packs from Fairfield. Repacks are all over the place - most are cards I wouldn't want anyway, but having low expectations, I was ready to dig in. The cube was sealed by some plastic stickers / tape - hard to get into without staining the cube permanently. 1988 Donruss Jamie Quirk #404 - a stare that could kill. 1986 Topps Gene Mauch #81 - the repack card that came out of some kid's collection from the 1980's. 1986 Fleer Baseball's Best John Tudor #40 of 44 - guy was a deer caught in headlights. 1993 Upper Deck Matt Mieske #704 - paper loss from being stuck in a pack for so long. 2013 Topps Update Series Yasiel Puig #US 330 - surprised this was in here, though it's worth about $2 at most...not even the actual rookie but the Rookie Debut subset card. Gruber was a third baseman acquired by the Angels - but after coming over in the 1992 offseason, Gruber ended up playing in only 18 games for the Angels in 1993 and was a bust. Some 20 random years later, the Angels have gone out and traded Peter Bourjos and prospect Randal Grichuk to the St. Louis Cardinals - for third baseman David Freese and reliever Fernando Salas. I feel Freese is similar to Gruber, though to be technical, there is no listing of Gruber - among the similarity scores on Freese's Baseball Reference page. However, they were both veteran players who played on a World Series championship team and have put up pretty good numbers in spurts - Freese, like Gruber so many years ago is expected to solidify third base for the Angels even though Freese is going to be 31 next season and isn't getting any younger. I'm crossing my fingers and hoping Freese can stick at third base for the next two or three seasons - I'm worried about his off-the-field problems in the past and I hope he'll be able control the vices that have derailed him and stay out of trouble. Unlike in St. Louis, Freese doesn't have to be a star as an Angel - just healthy enough to pencil in the lineup for 130-140 games with the potential to hit at least .270, hit at least 15-20 home runs and drive in at least 75-80 RBI. Maybe once considered a relief ace back in 2011 - it looks like the Cardinals soured on Salas and he spent much of the 2013 season buried in AAA. At this point of his career, what you see is what you get from Salas, so that is a bit underwhelming - but looks like he has a live arm and the Angels need more of those out of the bullpen to build upon for next year. I suspect a fully healthy Bourjos in 2014 is going to be fun to watch as he is a Gold Glove caliber defender in center field - at the plate and on the bases, I think he's the ideal National League player from the 1980's, where can he hit the ball in the gaps and run around all day long. I don't really know what to make about Grichuk - my best guess is he's a guy who has a lot of power, some athleticism and relative youth on his side. Under different circumstances I might have been a fan of another Major League team - but the Angels have been where it's at ever since I've started following Major League Baseball in the early 1990's. Through the last several years, things have been rough, with the Angels having underachieved despite high expectations - though with Mike Trout starring in center field for the Halos, it's hard to think things aren't going to get better. Over the past 20 years or so, it's been a pretty good run - the Angels have developed some great talent, won a World Series in 2002 and were perennial contenders through through the late 2000's. I respect the Dodgers' history and casually check out what current Dodgers teams are doing - though my rooting interests sticks with the Angels. In recent years, outfielders Matt Kemp and Andre Ethier have been banged up [especially Kemp] and have not played as good as expected - now either one maybe trade bait this off-season, though each is still owed a lot of money. I don't always watch the Dodgers, but when I do, I prefer Yasiel Puig - I love the energy Puig plays with whether he is at bat, on the bases, on defense and in the dugout when he is goofing with his teammates. The caveat however is for better or for worse, he really looks like he isn't in the same planet - it's hard to watch him when he looks like a Little League player who doesn't know quite know where he is at the plate, on the bases or on the field. He doesn't put up the greatest individual numbers but third baseman Evan Longoria makes this team relevant - I like how his batting stance seems so simplistic, but he's able to generate double after double and has the HR pop to 'clutch up' in crucial situations. It seems like ever since his rookie year, Longoria has been involved in every Rays postseason run - the guy is a money player. On the mound the Rays have gotten lucky with the pitchers that have come up through their system - but I don't know if Matt Moore or Jeremy Hellickson are ace quality types if David Price is traded, though they have other guys like Alex Cobb and Chris Archer looking to step up. 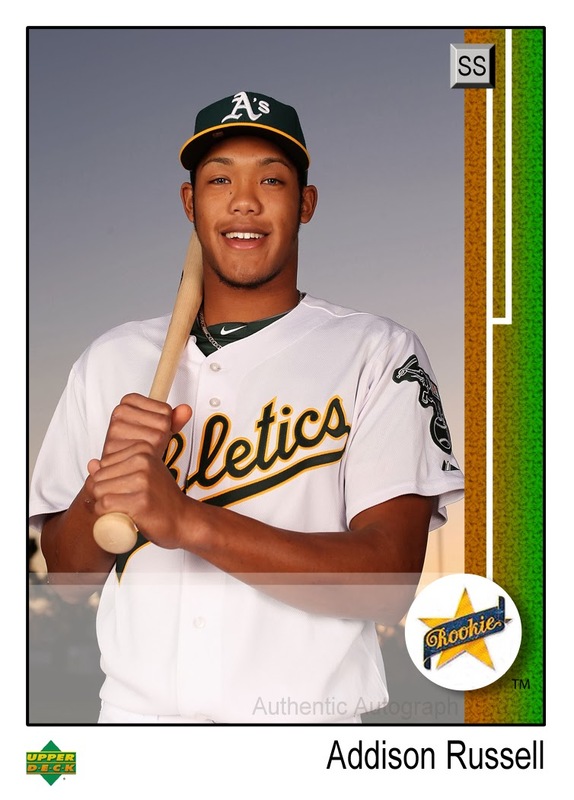 Shortstop Addison Russell was drafted in 2012 by the Oakland Athletics and in his first professional season in 2013 - reached AAA for a cup of coffee after spending much of the minor league season in A-ball in the California League. I downloaded a 1989 Upper Deck template posted on Sportscollectors.net, the one I used to create a Michael Roth card - I found an A's logo online and an image of Russell I liked, so I could slap things together. I added a version with the 'Star Rookie' logo - as a 'late edit' to reflect the idea that there is some anticipation to see what this guy can do in the Major Leagues in the near future. Unlike the Roth card, I put the Russell customs together on Photoshop - after I had found out in a SCN message board post, that there was a version of the image editing program available online for free. It's impressive how the Cardinals turn out players to contribute to winning teams - it doesn't mean they are going to win the World Series every year, but they are going to be in position to go far in the playoffs in most years. I remember being in St. Louis in 2006 when they won the World Series - I may recall vague memories of scrubs like Ronnie Belliard and Preston Wilson seemingly having the time of their lives because they were on a team that had won the World Series. That year's Cardinals team was pretty scrappy all around and even though they weren't as talented - they just ran past everyone else. When the Cardinals won the World Series in 2011, that was the last time Albert Pujols was ever heard from - I remember marveling at how huge his forearms looked and what a dominant player this guy was, especially after he'd hit three home runs in Game 3, just a day after baseball writer Jeff Passan dogged him in a scathing column. I picked up a hand collated paper set and a Chrome set of 2013 Bowman Draft so I double up on the number of base cards for each player on the checklist - much of my baseball 'off-season' as a fan / autograph collector is spent trying to reload as far as picking up random cards, unopened products, assorted hand collated sets, et al within a budget. 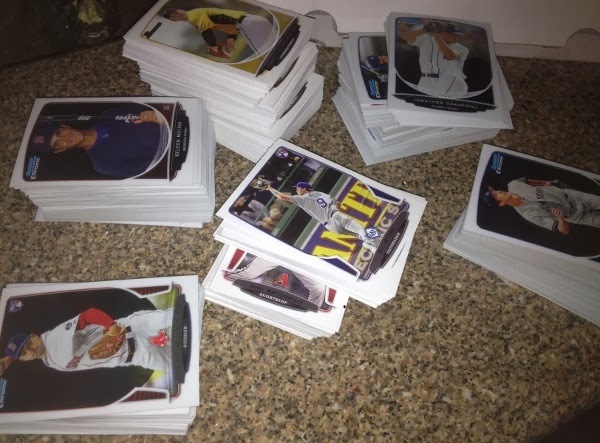 I want to pick up a couple of unopened boxes of 2013 Bowman Draft but don't like the idea of spending $120-$150 and realizing I'm still missing maybe 15-20 random base cards - at least with a couple of sets in-hand, I don't have to worry about wondering if I have a card for someone. The part I don't always like is trying to sort the cards and finding out where they belong - it's hard to look through these cards individually and feel like these cards are more than just little pieces of cardboard. Part of it is not knowing who most of the players are and the idea these guys may never heard from unless it's the guys who make it to the Major Leagues - a part of it is the idea I have to put these cards away ASAP without going through each card like I would perhaps cards I pick from a bargain bin / dollar and under box. The sorting gets tedious but I guess it's easier than actual box breaks, where I'm compelled to list everything I get somewhere - then have to go and separate base cards from common inserts / parallels to actual pulls, before sorting many of the cards into 'team sets' I have for my baseball autograph seeking adventures. It seems like GM Billy Beane has found a formula for building a MLB team in Oakland that can contend for the playoffs - even if they aren't as good as other teams when they get into the postseason. The A's are a division rival of the Angels and I don't particularly care for their recent success - still 10 or 11 years after Moneyball came out, it's impressive how bit players as well as natural talents [as far as pitching is concerned] have been cobbled together by Beane and his staff to help the A's win two consecutive American League West titles. I didn't know much about Sonny Gray except having a few of his cards and thinking he might be just another midlevel pitching prospect - but after having a fine debut season and a postseason start to remember, the slightly built flamethrower will dictate where the A's will go in 2014. If he gets hurts and/or is ineffective, the A's might not get as far as they've been the past two seasons - if things falls into place however, Gray might be the type to light the league up on fire and might be my dark horse candidate to win the 2014 American League Cy Young. 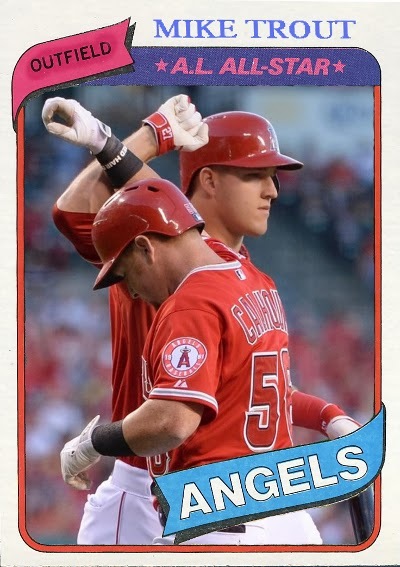 In recent years, the Angels are still looking up at the Rangers, so I can't really talk smack - I do feel like the Rangers have had it tough between losing the 2011 World Series, committing a choke job in losing the American League West title in 2012 and losing the Wild Card playoff game against the Tampa Bay Rays this past season. It seems like manager Ron Washington can't get a break - it seems like he is the one put on the firing line rather than be considered one of the main guys who is responsible for the team's overall success, regardless of their shortcomings. Yu Darvish might be the best pitcher in the American League with the potential to throw a no-hitter every time he is making a start - my in-person autograph white whale, I think he'd be the bees knees if he actually acknowledges and signs for me sooner than never. Adrian Beltre's numbers have stayed consistent playing with the Rangers and besides his bat, he continues to be a great defender as he enters his mid 30's - he is making a late career push towards the Hall of Fame, something that didn't seem quite possible when he is a just an OK player and quite a disappointment in Seattle. Prince Fielder has been knocked around in recent years - the narrative is he's all sorts of overrated because he's fat and getting paid $24 million a year until 2020. He's not a good defender because he's fat, he is a base clogger and worst yet - he's going to turn into Cecil soon enough. For a number of reasons, I don't think he's never been as lovable as his girth has suggested - he's no teddy bear and while might be a decent guy, he seems like he's all business. Is he ever going to hit 40 or 50 home runs again [?] - seems like he really took a step back this past year, even if he was dealing with an apparent divorce. It's going to be compelling to see how Prince does next season - after the Tigers' postseason failures in recent years, Tigers fans are wondering what they are going to be getting from Fielder going forward. The Yankees will always be relevant and I'm not going out on a limb to say some Yankees team in the future will win another World Series sooner than never - but how long has it been since they've been the No. 1 destination for a big money free agent? It seems like all their moves in recent seasons have been to sign replacement quality players - instead of going bonkers and signing a handful of All-Star talents in the prime. Even if they are able to re-sign second baseman Robinson Cano - the Yankees seem to be just another MLB team at the moment unless they get back to their old ways of either developing impact players that aren't merely trade bait and/or going after the top two or three free agents in the market in any given off-season. Closer Mariano Rivera has retired and though re-signed for 2014, A-Rod seems toast and Derek Jeter is facing baseball mortality - which seems so hard to imagine just several years ago.